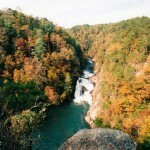 Less than an hour from Franklin is Tallulah Gorge: 1,000’ deep and 2 miles long. TheTallulah River, which carved out the gorge, drops 600’ through 5 waterfalls before it joins theChattoogaRiver. The first waterfall, L’Eau d’Or, is 46’ high and visible from overlook 3 which is accessible to wheelchairs on a rubberized path. After overlook 2, the serious hiking begins. Let me give you a hint: when the Park Service posts a sign that says “Caution: Strenuous Trail,” they mean it! The sign claims that there are 750 steps to the footbridge, and another 500 steps to the bottom of the Gorge. I got as far as the bridge before I gave up. The people passing me on the way back up said the view at the bottom was worth the effort. When I first moved here in 1973, I toured the Gorge on a trail that began at Stuckey’s and led down the opposite side of the river. 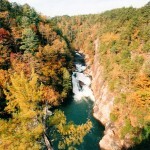 That was shortly after the movie “Deliverance” had been filmed in the Tallulah Gorge. In the past few years, the Park has opened this trail again. You can begin on the far side of the river at a private parking lot, or cross the footbridge and continue the trail from there. A free permit is required for gorge floor hiking, rock climbing, or rappelling because of the danger involved. In 1886, Professor Leon crossed the Gorge on a tightrope. Karl Wallenda repeated the feat in 1970. The Jane Hurt Interpretive Cente ris well worth the drive, even if you can’t hike in the Gorge. There are live reptiles, preserved larger animals, a bird-watching station, and a gift shop. The entire center is exceptionally clean and well staffed. A film and museum tell of the history of the town and area of Tallulah Falls. In the Grand Victorian Era from 1882 to 1910,Tallulah Falls was one of the most frequently photographed spots in the Southeast. 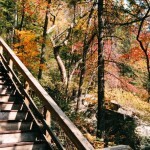 The Tallulah Gorge Railroad brought 2000 people a day during the summer and the town boomed with hotels and tourists. Then in 1913 Georgia Power built a dam to supply power to Atlanta, and the falls and the tourists dwindled to a trickle. A few buildings still remain in the old town of Tallulah Falls, including the old train depot which is now a craft shop. Water is released from the dam in April and November of each year. I try to plan to photograph the falls at these times. If you find yourself faced with an overcast sky as I was, aim your camera down a little and eliminate most of the sky. 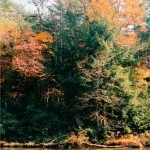 The wooded campground is within hiking distance to the Gorge trails, with comfort station and hot showers are available. Across the highway isTallulah Falls Lake. Keep your parking permit from the Interpretive Centerto use here also. During the summer, the sandy beach is open for swimmers. There are several paved trails for hiking and biking. 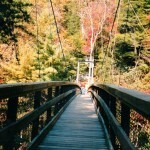 The Shortline Trail is follows 3 miles of the Old Tallulah Falls Railroad bed and also runs along for very pleasant walk.